I don't know about you, but my kids' backpacks are a black hole. Sure, if there is something they want me to see, like a birthday party invitation, I may actually see it in time to RSVP. More often than not, though, these mysterious papers don't materialize until after deadlines have passed. This is after they both assure me that their backpacks have been emptied. As they get older, it seems that they keep a lot of their school work & papers at school, only bringing them home at the end of the school year. This year was no exception and during each of the last 3 or 4 days of school, they came home with backpacks full of paper, school supplies, projects, etc. In talking with people, one of the most frequent things I hear is how overwhelmed they feel by paper. This could be bills, mail, papers that come home from school, etc. And I totally get it!! Luckily, Iâ€™m going to give you some ideas for managing all that stuff that comes home in your kidsâ€™ backpacks. Previously, in my home, my â€œsolutionâ€� had been to dump everything into plastic boxes. This is one kid's stuff. Papers, etc. in the bottom & miscellaneous, bigger items in the top one. Hey, at least it looked organized & was contained. I usually remembered to write the date & my childâ€™s age/grade on the back. 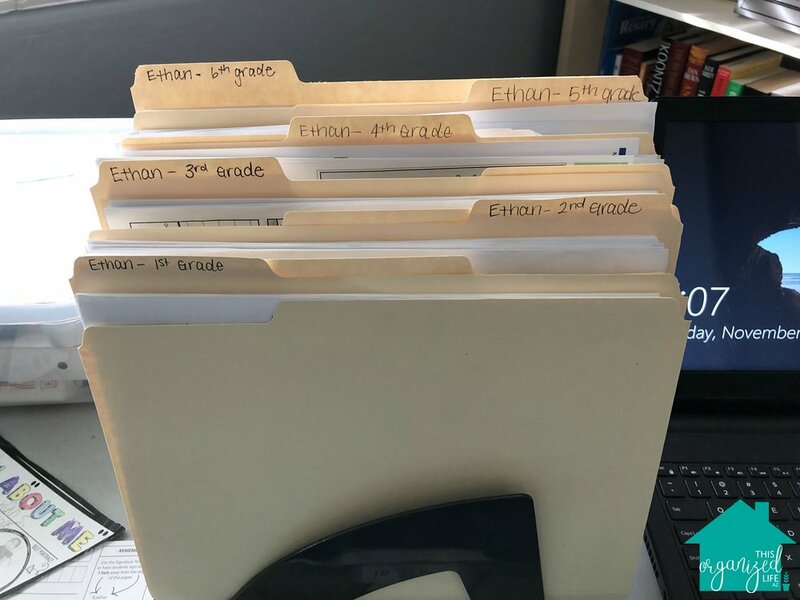 As my kids got older & accumulated more stuff, I stepped up my organization game & organized by grade in manila file folders. As your kids are emptying folders & backpacks, decide immediately what can be tossed/recycled. Label any â€œkeepâ€� items with their name, grade or age & file in their grade level folder right away. A word of advice-I recommend saving no more than 1 item each week (unless itâ€™s the end of a quarter & they are bringing home several monthsâ€™ of work). Why? There are on average about 35+ weeks of school. Our goal is for you to go through these papers again later & the less there are, the easier this will be. 2. Pick a day during the summer to sit down & go through the grade level folder with your child(ren). Schedule it on the calendar. Make it even better by having a special treat. This is a wonderful time to reminisce. You could use this opportunity to record a video or jot down some of your kidsâ€™ comments as you are going through their things together. My kidsâ€™ teachers usually give them some sort of memory book (usually some printed papers stapled together.) I would love for my kids to actually fill it out. However, when they sit down, they claim they canâ€™t remember anything. This is a great time to capture these memories as they relive their experiences. 3. The goal of this reminiscing session is not only to remember the highlights of the past year, but also to continue to trim down the number of papers you save. Personally, I try to save only 5-10. I know it can be hard to get rid of these treasures, but remember, the ultimate goal is that we are able to enjoy these things, not just have them sit in a file. With saving 10 items per year between preschool & 6th grade alone, you could end up with 100 things. Do you honestly think that youâ€™ll sit through a slideshow or flip through a photo album with 100 handprint pictures from your young artist? 4. I havenâ€™t mentioned this yet, but as we know, not everything that comes home can be fit into a file folder. If you want to save these other items, a great space-saving idea is to take a picture. Yes, you can save a few of their clay sculptures here & there, but the macaroni necklace is probably best remembered with a photo. Now is the time to decide if you want to hang onto these papers or go paperless. There are advantages and disadvantages to both so it is up to you. Insert papers into page protectors & file in a 3-ring binder. Make sure to store the binder somewhere that you can enjoy flipping through it. Use subject dividers to organize by grade. If you do chose to store it away somewhere, you can put into a file folder & store in something larger (like the plastic storage tubs mentioned earlier). If you want to go paperless (or have both hard copies & an electronic fileâ€”a great backup, just in case), read on. 5. Scan or take a picture of the 5-10 masterpieces youâ€™ve all chosen to save for the school year. Upload them to your family hub or wherever you store your important electronic records (more on this in a future post). There are also several apps available that allow you to scan, upload, save & share all these important things. Iâ€™ll talk more about that in an upcoming post. Now youâ€™re done! Pat yourself on the back for a job well done. This is a lot to fit into our busy lives. You are an awesome parent who is curating your kidsâ€™ memories well. And, you won't have piles of paper stuffed into drawers or cluttering countertops anymore! Sign up to get our organizing tips. We promise we wonâ€™t clog up your inbox. We hate clutter!